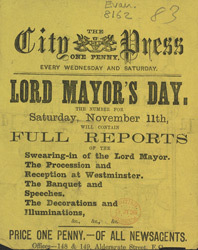 The edition of the City Press advertised here featured a special report on the Lord Mayor’s Day celebrations of 1883. The first recorded mayor of London was Henry Fitz-Ailwyn 1189. In 1215 King John granted a charter that allowed citizens of London to elect their own mayor. This charter specified that the mayor had to be presented to the monarch and travel from the City to Westminster to pledge allegiance. With the building of Buckingham Palace in the 18th century, this journey became so grand, and began to involve so many people, that it became known as Lord Mayor’s Day.